The safest PBT glove arrived to prevent from hand injuries caused by stiff broken or non broken sabre blades. 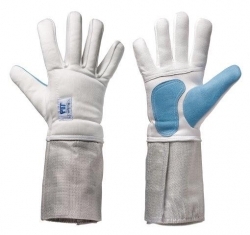 Glove is designed for perfect protection,fit and grip according to the FIE guidelines. Made of the possibly thinnest 800N fabric on the palm,thumb and the back of the hand and between the fingers.No seams between the fingers reduce the penetration risk. Artificial leather parts inside the fingers,thumb and on the palm for better grip. Recommended to take one size larger than what the sizing chart suggest below.